What’s a holiday movie without a dozen relatives (and a newcomer) crowded around a food-laden table, trying to dodge conversational land mines (or in some cases, hit them) as they settle in for a chaotic, tension-filled meal? Those annual feasts bring together so many elements that make for great scenes: people of all different ages (who have known each other forever) trying to get along; fancy food dishes that may or may meet Grandmother’s expectations; significant others new to the family and unfamiliar with the traditions and family histories; and generations of relationships, resentments and regrets that surface and collide when families gather in one room. Add alcohol and meat to be carved, and the set-up is complete. 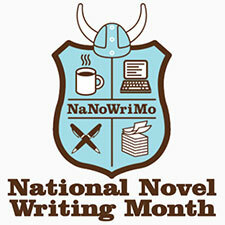 So how about adding a holiday meal scene to your NaNoWriMo novel? My goodness, the potential for increased conflict, fresh character details, and snappy dialogue is so great! And any holiday will do – it doesn’t have to be the traditional turkey-stuffing-and-gramma’s-pie holiday. Your scene could be set at a 4th of July BBQ, a Mother’s Day brunch, a birthday picnic at the park, or a welcome-to-the-family wedding rehearsal dinner in a fancy restaurant. As long as you seat lots of people around one table, you are sure to find a novel-worthy scene. But not every meal has to be chaotic to add tension and depth to a story. This awkwardly quiet dinner scene from My Big, Fat Greek Wedding makes a great contrast to the loud Easter scene. And it doesn’t take a holiday to make a meal memorable. This dinner scene from New in Town introduces a big-city girl to a small-town Minnesota family, where she manages to offend nearly everyone at the table. It’s often that fish-out-of-water that makes a meal scene sizzle with tension. So set the table, light the candles, bring on the food, and let your characters dig in!